Fusion-Crete is a contractor grade vinyl copolymer designed to modify Portland cement and sand mixtures for cost effective and durable concrete repair and restoration. 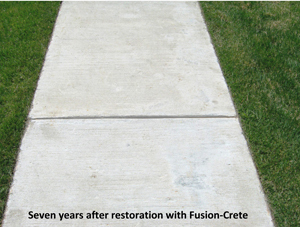 Long-term concrete resurfacing product repair results with Fusion-Crete! 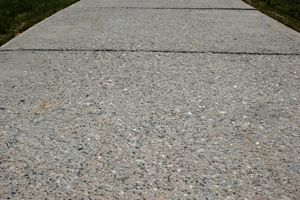 This sidewalk can be made to look like new with Fusion-Crete concrete resurfacing product. In 2006 the walkway concrete at this resort condominium complex was sound but badly in need of a concrete resurfacing product. The damage pictured is called spalling. The homeowners association and the property management company were positive the concrete would have to be removed and replaced to restore it to an acceptable condition. The walkway runs through a lawn with flower beds and an irrigation system. The subsoil in the area is high in clay content and accessing the area with equipment for removing and replacing the concrete would severely damage the landscaping. 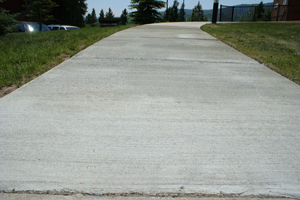 The walkway was restored in July 2006 with Fusion-Crete concrete resurfacing product at a fraction of the cost of replacement. Slip and fall hazard is controlled by regular use of chloride based snowmelt agents during the long Rocky Mountain winter at 6700 feet above sea level. After repair with Fusion-Crete concrete resurfacing product, the walkway has remained in excellent condition for over eight years. Damaged sidewalk looks great after repair with Fusion-Crete concrete resurfacing product! Completely spalled sidewalk can me made to look like new with Fusion-Crete concrete resurfacing product. These photos are taken at a vacation resort property that insists on pristine appearance. 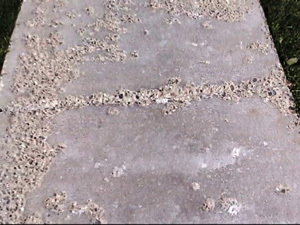 Over 50% of their sidewalks displayed moderate to severe surface spalling in 2011. The most recent phase of restoration with Fusion-Crete concrete resurfacing product was completed in September 2012 and continues in excellent condition February 2015. Contact us now for concrete repair product pricing and to learn how to solve your concrete problems quickly and economically with Fusion-Crete ® .